As a strong believer in the use of your core muscles in swimming as with many other sports, Stand Up Paddle Boarding (or SUP), is another I can add to my list! On a recent trip to Portugal I had the opportunity to try Stand Up Paddle Boarding. I know from my good friend Jeremy Laming of Open Water Clubs and Henley Swim how good a sport it is and he recently wrote an article in H2Open about the benefits, including how it has helped him improve his own swim stroke! So while over in Vilamoura, I was introduced to Nick Robinson of Algarve SUP. Nick is South African by origin however he has now lived in Portugal for several years. Like myself and swimming, Nicks passion for ‘Stand Up Paddle Boarding’ has now turned into a business, where he shares his knowledge with others on a great day out learning the skills required for the sport in some cracking locations. I had never had a go at this sport before and I’m always up for new challenges and experiences. After all just because you can swim doesn’t mean you can stand up on a board and paddle! Nick took Gemma my partner and I to a stunning lake near Albufeira in Portugal. I was surprised that the boards were inflatables and was almost skeptical about how they would actually feel on the water. However once inflated I was shocked at how rigid they were, made from a hardened rubber material, heavy duty PVC, layers of urethane and polymer, there was no give in the surface when you stood on it. This was like music to my ears and something I can really relate to as the benefit of using the core is what I passionately teach in my swimming lessons. Also it made complete sense as so many sports use the core including kayaking, skiing, golf, tennis etc. It was my first time having a go and I could definitely feel all my muscles working which was great. Whats more, this sport is suitable for anyone and can be done as a family. Once you have a few goes you will soon master your balance and I can see how easily you could get hooked as Nick did. 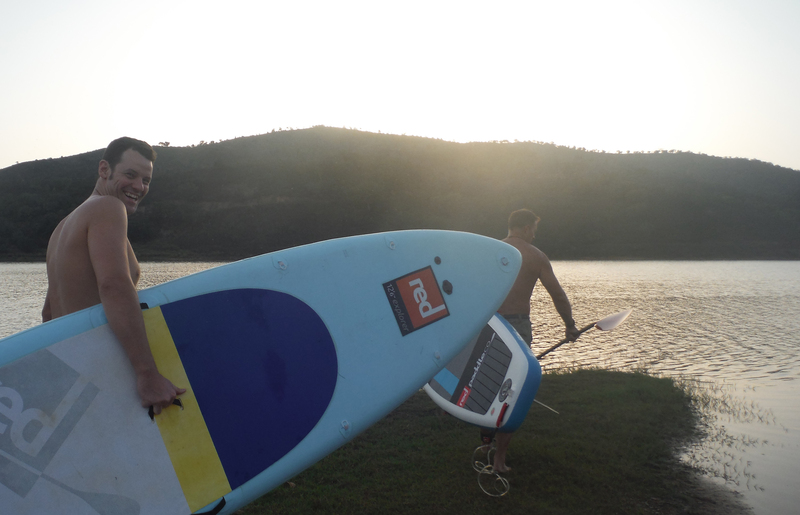 After Jeremy wrote the article for us in H2Open I bought an inflatable SUP for the family. You can inflate it in about 10 minutes and it rolls up small enough to through in the car. We took it on holiday with us. The kids loved it and were immediately much better at it than us oldies but it was great fun for everyone, and a really good way to look after someone in the water too.